SOLT Menthol delivers a fresh and frosty vape with a hint of peppermint for extra depth. If you’re looking for a refreshing all-day vape with a cooling finish, SOLT Menthol e-liquid could be the one for you. 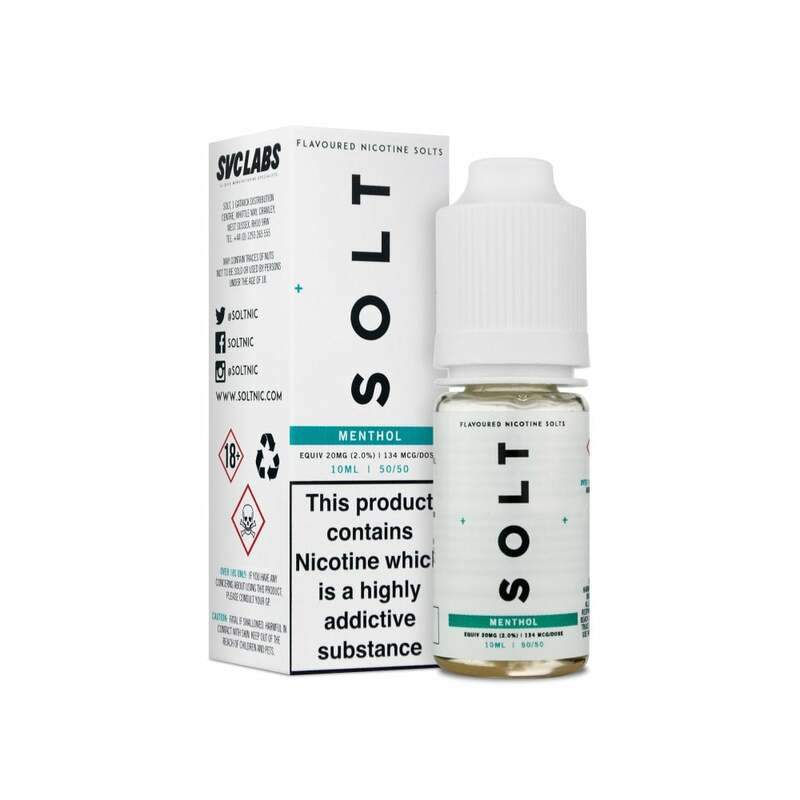 SOLT e-liquids are made with nicotine salts for a strong and satisfying vape every time. Each SOLT e-liquid comes in a 10ml bottle and has a nicotine strength of 20mg. DPD Next Day orders must be placed before 4pm Monday to Friday and 1:30pm Saturday. All orders placed before 4pm Mon-Fri and 11am Saturday are despatched same day via Royal Mail First Class (Royal Mail 24) delivery service. Excludes Bank Holidays. UK Delivery is free with all UK orders £10 and over. Delivery is £1.99 on orders under £10. UK orders over £49 are sent out via Royal Mail First Class Signed For (free of charge to the customer). Our free UK delivery service will generally mean that your order will arrive the day after you place the order if placed between Monday and Friday before 4pm, however, on the rare occasion, orders may take up to 7 days to arrive. Please note that Royal Mail do not deliver on Sundays. DPD deliveries aim to be delivered the next working day when placed before 4pm Monday - Thursday. You will receive an email allowing you to track your delivery once it has been despatched. Next Day delivery is not guaranteed in certain outlying areas (please see below) and deliveries do not take place on Bank Holidays. Available between 4pm Thursday and 4pm Friday. Same terms as above apply. Available between 4pm Friday and 1:30pm Saturday. Channel Islands, Northern Ireland, Scottish Highlands and Islands - Where possible we will despatch orders to offshore locations and the Highlands using Royal Mail 1st Class Post and other delivery services, but please allow a little more time for them to arrive. DPD Services to Scottish Highland & Island areas will be a 2 day service. DPD services are not available in Northern Ireland or the Channel Islands; Royal Mail Signed-For will be offered instead. Deliveries to Europe are free with orders over £150, £5.99 for orders between £50 and £150, or £9.99 for orders under £50. Orders to Europe typically take 4 to 7 working days but on occasion they may take longer. We do not ship outside of Europe. What is Electric Tobacconist® Returns Policy? What strength of e-liquid should I choose? How long will a 10ml bottle of e-liquid last me? Where is this e-liquid made? What type of clearomizer can I use this e-liquid with? What is the PG/VG ratio of this product? If you order by 4pm on a week day your order will despatch the same day. Our Royal Mail standard delivery method means your order should arrive next working day from despatch date (and this is the case 90% of the time), but please wait 7 days before contacting us. If you need it quicker, you can select a faster delivery method (eg Royal Mail Next Day Guaranteed) in the checkout under "Shipping Method". For more information, click the Delivery Tab. The Electric Tobacconist® Ltd abides by the Distance Selling Act (2000). If, once you have purchased items from us, you decide you no longer want them, then you have 28 calendar days in which to return them and we will refund them in full within 28 days of the cancellation date (including any postage and packing paid) as long as the packaging remains unopened. This excludes e-liquids, clearomizers and disposables. PG (propylene glycol) and VG (vegetable glycerin) are the main constituents used in e-liquid. VG is more viscous (thicker), slightly sweeter and produces larger vapour clouds. Most first time users tend to lean towards higher PG content, but the more experience you gain with vaping, you might want to try higher VG content, especially when using box mods. Note: we do not recommend using VG content of higher than 50% with plastic clearomizers as they may cause cracking. If you smoke (or used to smoke) more than 20 cigarettes per day then 18mg-20mg is advised (20mg is maximum strength now allowed under UK law). If you smoke (or used to smoke) around 20 cigarettes per day then 16-18mg is advised. If you smoke (or used to smoke) around 10 cigarettes per day then 10-12mg is advised. If you are using e-cigarettes as a means to wean yourself off tobacco, then reducing your level to 8mg and below is advised as soon as it feels comfortable to do so. If using a sub-ohm device, you may want to cut the amount of nicotine in half at the very least (e.g. if you use 12mg, go for 6mg or 3mg instead). Vaping habits are different, so it's hard to say... some people like to puff away all day and other people use their ecigs more sparingly. As a rough guide, the average 20 a day smoker of traditional cigarettes would get through a 10ml bottle every 3-5 days or so. You can use this e-liquid in any type of clearomizer we sell. © 2019 Electric Tobacconist. All Rights Reserved.